The mayor of Whoville calls fellow Whos to save their community! In the beloved children's tale Horton Hears a Who, every voice counts in making a difference and inspiring change. 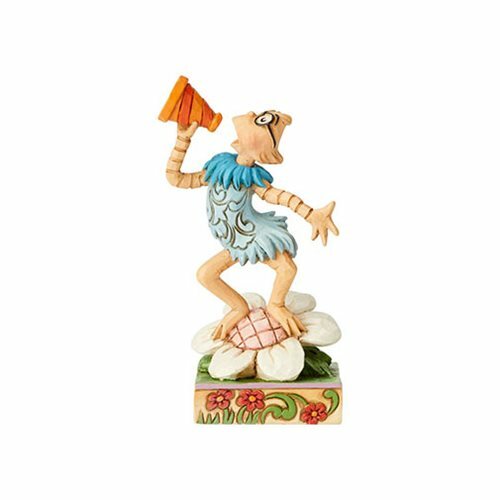 Adorned with beautiful folk art flourishes, the Whoville Mayor stands atop a blooming flower and an intricately handcrafted base with lovely floral motifs. Celebrate the heartwarming Dr. Seuss classic with this uplifting Jim Shore design in your collection. The Dr. Seuss Horton Hears A Who Whoville Mayor Statue by Jim Shore is made of stone resin. Measures about 3 9/10-icnehs tall x 2 1/10-inches long x 1 3/4-inches wide.